Sulfur Recirculation has been shown in this project to decrease the high temperature corrosion rates, which may increase green electricity production from combustion of biomass and waste in the future, KME 714.
biomass and waste. In order to do so, sulfur species is recirculated from the flue gas cleaning back to the boiler, thereby making the environment less corrosive in the superheater region. This enables longer superheater life time and/or higher steam temperature and electricity efficiency. The first Sulfur Recirculation full-scale installation has been in operation at MEC (Måbjerg Energy Center) since October 2016, which allows a unique possibility to study the long-term effects of different fuels, i.e. corrosion memory effects. In the project, the Sulfur Recirculation environment has been characterised and conventional superheater materials as well as state of the art stainless steels have been tested both in corrosion probe tests/fixed installations. 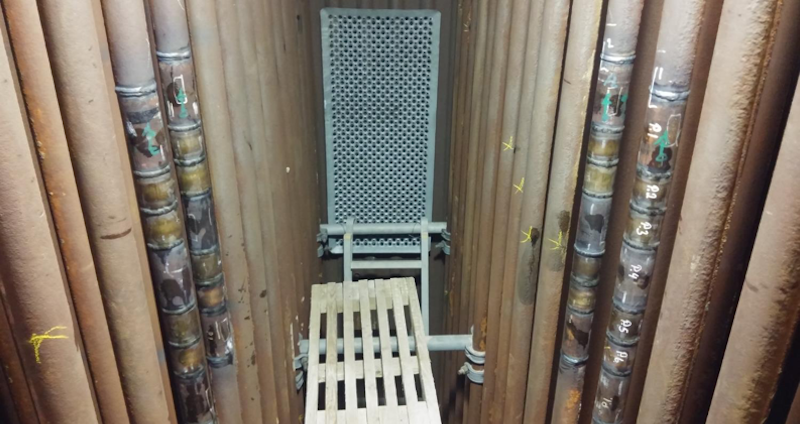 The results are very promising and thickness measurements of the superheater test tubes after ½ year of operation indicate a 75% corrosion rate decrease with Sulphur Recirculation. Direct measurements on the actual superheaters showed a corrosion rate decrease of more than 80%. The project in addition aims to generate increased understanding of selective internal corrosion in biomass firing and the influence of precipitation reactions on long-term superheater lifetime. Previously candidate steels have been tested both in the laboratory and in the plant as as-received steels, and the measured corrosion rates are used for lifetime prediction. It has been observed that increase in Cr led to increased internal corrosion attack. Controlled heat treatments of a modified 310 steel (solution treated), was used to provoke the presence of Cr rich precipitates within the steel. In this way, the same steel could be tested in the laboratory with the same composition but two totally different microstructures. After only 168 h exposure at 600ºC to KCl deposit in flowing 15%H2O + 5%O2 + N2 gaseous environment, the heat-treated steel revealed internal attack which was five times greater than the solution-treated steel, and the area around/at Cr rich sigma phase precipitates was preferentially attacked. Microscopy characterisation of specimens such as Esshete 1250 exposed in power plants revealed that at higher temperatures and longer exposure times, Cr rich precipitates were also visible at the fireside of the tubes, which could lead to preferential attack. This highlights that microstructure evolution from heat treatment/exposure can change the corrosion rate, and that the past life of a component is a factor to be considered in lifetime assessment. Ove Hauris Jespersen, Niels Peder Hansen, Torbjörn Jonsson, Jesper Liske, Loli Paz, Julien Phother, Kristian Vinter Dahl, Melanie Montgomery, Yohanes Chekol Malede, Thomas Norman, Lars Mikkelsen, Sven Andersson and Søren Aakjær Jensen. Dong Energy, Babcock & Wilcox Vølund A/S, Babcock & Wilcox Vølund AB, Maabjerg Energy Center and BioHeat & Power A/S.